Turbaconducken. 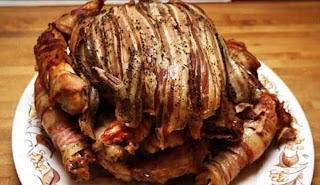 This would be a duck stuffed inside a chicken stuffed inside a turkey...then wrapped in bacon. And you can try this at home! There are complete instructions (5 pounds of bacon required for this recipe) with photos available from the fine folks at Bacon Today: Daily Updates on the World of Sweet, Sweet Bacon. So, what are you making for Thanksgiving? That bacon wrap job is truly a work of art. I will be frying a turkey, and also making the sweet potatoes and the corn pudding.